January 23, the registration certificate ceremony for the first batch of foreign Non-Governmental Organizations (NGOs) was held in the Beijing Municipal Public Security Bureau Exit-Entry Administration Zhongguancun alien service hall. 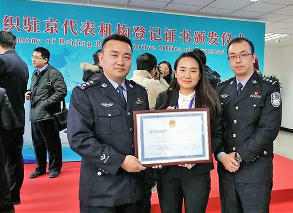 The Office of Overseas Non-Governmental Organizations of the Beijing Municipal Public Security Bureau issued on-site registration certificates for representatives of 20 NGOs, such as the Beijing Representative Office of World Economic Forum, Paulson Foundation and International Saving Children Society. Officers of Ministry of Foreign Affairs, National Development and Reform Commission, National Planning Commission, National Forestry Administration and other departments participate in the ceremony. Britain, France, Switzerland and other countries embassy officials were invited to attend. According to the briefing, 20 foreign NGOs attended the ceremony, mainly from the United States, Germany, UK, France, Switzerland and other countries, as well as Hong Kong and Taiwan, involving economic, environmental protection, health, poverty relief and other areas. For more details please check Public Security Bureau of P. R. C.